Welcome to our first-ever Holiday Fundraising Campaign! We are reaching out to our colleagues, friends and families to help support our goal of raising $25,000 in support of the 2017 Program Initiatives. More than 8000 Syrian refugees have settled this year in the GTA, with more still to come. Their lives have been completely interrupted by the conflict, often displacing families, and unsettling all the things they have come to know. These experiences coupled with the migration experience and relocation to a completely new country and culture often leaves families, particularly children disoriented, disconnected and vulnerable. That is why Turtle House is here - to reach out and support these families in an effort to create a safe environment, where through the exploration of art and music together, community is built, support systems are put into place and light begins to shine through the uncertainty and darkness. There are so many ways to make a difference; here are just a few of our key ones. Donate $36 to sponsor one child experiencing the wonder of a multi-faceted arts session including ceramics, painting, singing and music. Donate $50 to support the hiring of a Canadian artist or musician to lead these arts sessions. Donate $100 to sponsor a whole family’s participation in this incredible arts and music session. Donate $250 to sponsor a child’s entire 7-session experience. Or make whatever contribution you are able to - just know every donation counts towards changing the lives of these children and their families. The Turtle House Art/Play Centre provides safe haven for refugee children and their families. 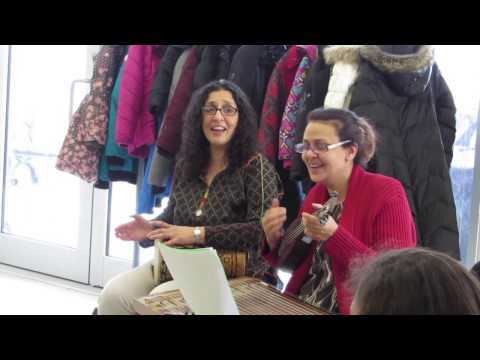 The program incorporates art, music and recreation in a community environment for refugee children (5-12 years) as well as a Conversation Circle/Discussion Group for their parents to connect with each other and to gain necessary information on how to navigate the system of their new home. Trained facilitators and local artists/musicians lead all sessions; all programs are free, with additional supports, such as TTC fares, refreshments and interpreters (where necessary) to increase access to the program. Turtle House is dedicated to play a vital role in building a Toronto where refugees and immigrants are welcome; where arts flourish in every neighbourhood and people are encouraged to explore their creativity.